Or, get it for 31200 Kobo Super Points! Drawn from best practices, this casebook provides a practical road map and real-life case studies to help students develop the necessary skills to design, negotiate, and manage domestic and international alliances. 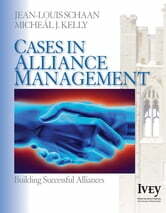 Editors Jean-Louis Schaan and Micheál J. Kelly have organized this book around the four major phases in the alliance formation and management process—strategic rationale, partner selection, negotiation, and implementation.